Great product, I have a set of bulls eye quick loads on my 2004 Procraft Pro185 Bass Boat. After several trips to the lake, I dont think I'll be taking them off any time soon. They are fantastic. I have been in some very high winds and my boat went on center of my trailer the first time every time. I have told many people about them, and this weekend I will tell my bass club about them too. My family lives in Wasington state and we have Bullseye Quickloads on our boat trailer.Before Bullseye my husband always had to back the trailer into the water.Then go get the boat and load it.Once we put the Quickloads on the trailer he decided to have me give it a try.After all we heard that anyone could load a boat using the Quickloads.The first time he had me load the boat it had begun to rain and the wind wasn't exactly calm. I was nervous because the weather and I hadn't loaded a boat in several years....Wow! I drove the boat onto the trailer, the Quickloads did their job to perfection; my hubby hooked the boat to the trailer, and WALA! we were out of the water.I have to say my husband isn't very generous with compliments,but he actually gave me an atta girl and was impressed at how well the Quickloads worked. Our fishing trips now end in smiles since nobody is frustrated with loading the the boat.Now we actually fight over who has to back the trailer and who gets to load the boat....Thanks for making our fishing trips fun from beginning to end. When I retired, moving from Alaska to Texas in 2010, I purchased a Caravelle Interceptor to play with, mostly in Lake Georgetown and Travis, in Austin. Most of my water time was alone, so launching and retrieval was definitely multi-tasking. I contacted Chuck after reading about the BullsEye QuickLoad system, he modified a 2-pack to fit the streamlined hull design. They were so effective, my 16 year old granddaughter was able to drive the boat onto the trailer at the ramp, setting it in the middle every time. Her first couple of landings were a little fast, she hit hard and off target on approach, but the strength of these guides handled those hits just fine, no flexing at all. These things are heavy duty! Needless to say I got lots of attention around local ramps. After selling the boat, leaving Texas for Washington State in 2013, I bought a Skeeter SK2000, 20’ bass boat, commonly called the aircraft carrier of bass boats, wide and long. Since I’m the only fisherman, my splash time is almost always alone or with an inexperienced fisherman aboard. I contacted Chuck again, this time ordering a 4-pack, which made things even more straightforward. The hull design of the Skeeter being unique and wide, I contacted Chuck, and we found a cure. I thought the videos of loading with no hands was a gimmick until I experienced it for myself. Both times I had issues I couldn’t work out, calling Chuck, chatting about our experiences in Alaska (Chuck lived many years just North of my home in Anchorage), by the time we were done “bench fishin”, everything was good to go. Besides landing the boat on the trailer like a pro every time, the best thing about these guides is the loading/travel feature, which moves the guides from the perfect loading distance from the hull to a perfect distance away when rotated – no chafing or rubbing whatsoever. Here in Washington I fish the Columbia and Snake Rivers, sometimes dealing with big wind and varied current (depending on the dam authority flow requirements), but none of that is an issue. I see others waiting in the small boat harbor for the wind to die down, for me it’s “outta my way boys, coming through”! the best show in town is watching others up to their waist trying to square their boat on the bunks, none of that for me! Great job Chuck, BullsEye has it going on in a big way! Thank You so much for a GREAT and sturdy product. Now days you buy a new boat and trailer thinking it is better that what you had 20 years ago and find out that they left out "what you were used to". in this case the side stabilizers for windy loading conditions. Well now I have the best! 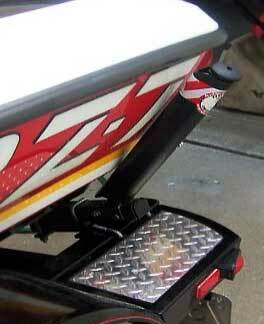 The first use with your product was wonderful, easy, and no more scrapes on my new boat or trailer. This sure beats the cheap, aftermarket crap they have on the market. THANKS!!!! when I'm at other difficult ramps. By the way, Chuck was extremely helpful and willing to talk anytime. He even called me. Thanks again Chuck. I am impressed with your product. With just a couple of pictures That I sent to bullseye, chuck was able to fabricate custom mounting brackets that worked great without modifying my trailer. Without bullseye guides trying to load an 18 foot jet boat on a trailer when the Yellowstone river is roaring due to the spring thaw was a bit difficult to say the least. This product has taken the only thing not fun (other than getting stuck on a sand bar) out of boating on the river. Thanks bullseye for a high quality product. “I posted here a while back about my dealings with Chuck for my ski boat and my Skeeter SK2000 bass boat. Since then I moved to Nine Mile Falls, Washington, sold the bass boat and bought a 20’ Tracker Tahoe Fish & Ski. The first thing I did was call Chuck and order more Bullseye Quickloads, putting four of them on the new trailer. The first time out with my wife was smooth, I backed the trailer in and drove the boat right into the pocket. The next trip was with my neighbor, his friend his grandson from Seattle. At the end of the day we docked, I went to get the trailer. As soon as I had backed down the ramp my friend began to tug, push and pull the boat trying to line it up for me, thinking he was doing a favor. I told him, nah, threw the ropes in, shoved the boat off, looped it around and drove straight onto the trailer, coming in at a slight angle, the guides docked the bow perfectly while they stood and watched. Once out of the water I just walked around the trailer, coolly putting the guides in the travel position. Not a lot was said then, but down the road a mile or so one of them asked out of the blue “so where did you get those loading guides?” I had to chuckle to myself knowing they had been thinking about them this whole time. This is my third set of four from Chuck and the fourth boat trailer I’ve had them installed on. Every time I called he bent over backwards to make sure I had what I needed, offering to customize any part if needed. This last 4 pack I installed in less than an hour, including the rears which required me to drill through the step plates, which was not a big deal. Chuck and I always talk at length whenever I call, plus he notifies me when parts ship then calls to ensure things went well. At first I thought his hands on, friendly way was left over from his days in Alaska, as I spent over 40 years there myself. After getting to know Chuck, it’s clear that’s not the case, he’s just a genuine good guy…how refreshing that is these days. I must say that everything you see and read about this product on this web site is accurate. I am extremely happy I ordered them and would order them again. I purchased a 4 pack for my Lund 1625 Fury XL Sport. I had an issue of not having enough clearance between the top of the trailer frame and the bottom of the boat to fit the 1 1/2" x 2" tubing for the rear guides. I contacted Chuck and gave him a couple of measurements. He came up with a solution just as perfect as the original design. This issue is the same for Lund 1650 Rebel owners. Do they work? Yes they do. The ramp at the lake I normally go slopes towards the Starboard side. As you can imagine, it was difficult for this old disabled vet to get my boat centered. More difficult if there is a cross wind. This is no longer a problem after installing BullsEye Quick Load. When installing the load guides, I left 1/8" clearance between the boat and the guides. Thus making the boat centered every time with ease, even on windy days. My boat is loaded correctly every time the first time. No more backing up and reattempting to load my boat. Chuck has a good thinker on his shoulders and glad he put it to good use. These guides has made loading my a simple task.
" Guides that have superior strength and time proven results "
Bullseye Quickloads are designed for vertical and horizontal adjustability, also designed for boat trailers with rear frame step . Bullseye Quickloads are over engineered for strength. If you want a strong boat guide you have to build a strong frame mount. Bullseye Quickloads have a industrial strength trailer frame mounting system (not just a small attachment bracket) our mounts are thick laser cut steel with stiffener plates welded in the correct locations. 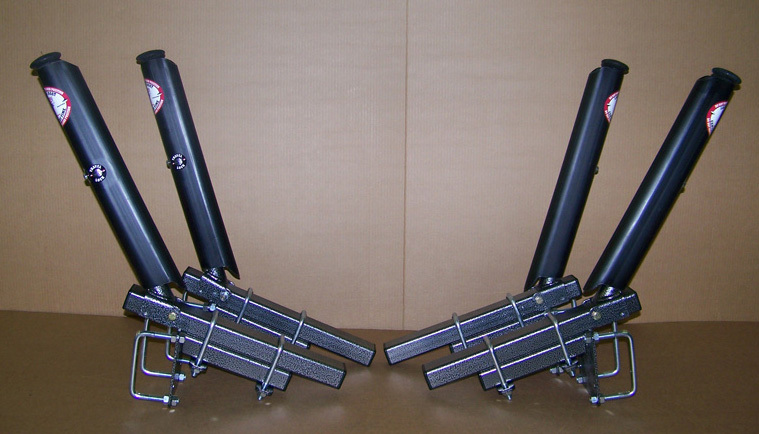 The upper horizontal and vertical outrigger assemblies are heavy wall steel construction, all professionally welded. Bullseye Quickloads are not flimsy visual aids, they are serious equipment that will take the punishment and will absolutely control your boat during the loading process. Bullseye Quickloads delivers adjustability and superior strength over most aftermarket boat guide on systems. Bullseye Quickloads are simple to adjust, drill one hole, then install and tighten bolts, all adjustments are locked vertically and horizontally to fit your boat and trailer combination. Two universal model choices...The 4 pack provides a perfect load every time. (4 point control) and the 2 pack is for those who just need a little extra help. ( bow loads fine but the stern doesn't or visa versa) Made in the USA. 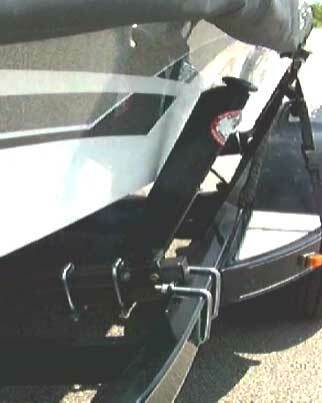 Designed/Engineered for boats up to 21 feet in length, the BullsEye Quick Load HD system is equipment that is easy and fast to install on your trailer,( 8-10 minutes per unit). Bullseye provides a patented push button lock vertical swivel system that can be switched between loading and traveling modes. The Quick Load HD ensures consistent smooth centered loading, while protecting your hull during loading operations. A typical guide-on is 2"-4" from each side of boat, these guides may get you on the trailer, but are you center? the BullsEye Quick Load system, loads you truly straight, every time. Protecting your investment, Loading your boat in a fraction of the time, with far less wear and tear on boat hull and trailer equipment. Simple, Bolt-on Installation: Everything you need is in the kit, only one hole to drill. 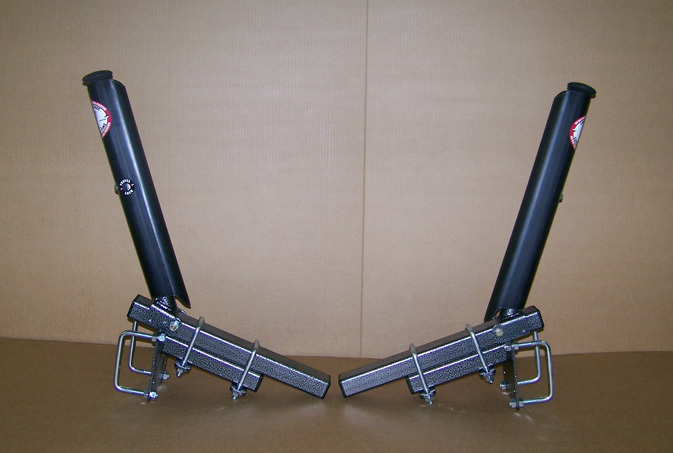 BullsEye Quick load units are a universal fit. They fit trailer frames 4"x1.5",4"x2", 3"x2"and 3"x3" with U-bolt attachments. 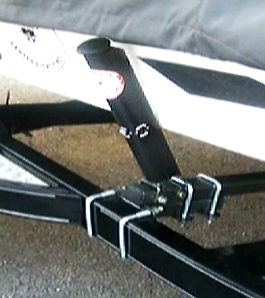 Also fits boat trailers with rear frame steps ( click here for rear step instructions ) 2 additional holes are required for the rear step installation. Plastic contact points to provide ample protection.
" 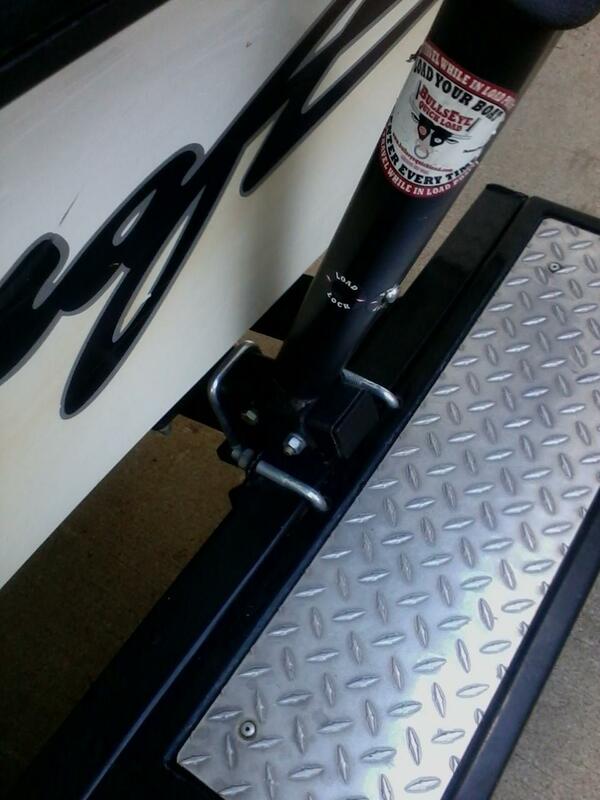 N0 Frustration At The Ramp "
Need a custom mount or have a question, 816-674-5681... Ask for Chuck. 2 pack or 4 pack question, give me a call. HD-S or HD-L question, give me a call. International shipping (outside the USA) requires additional shipping cost, please email or call for quote. 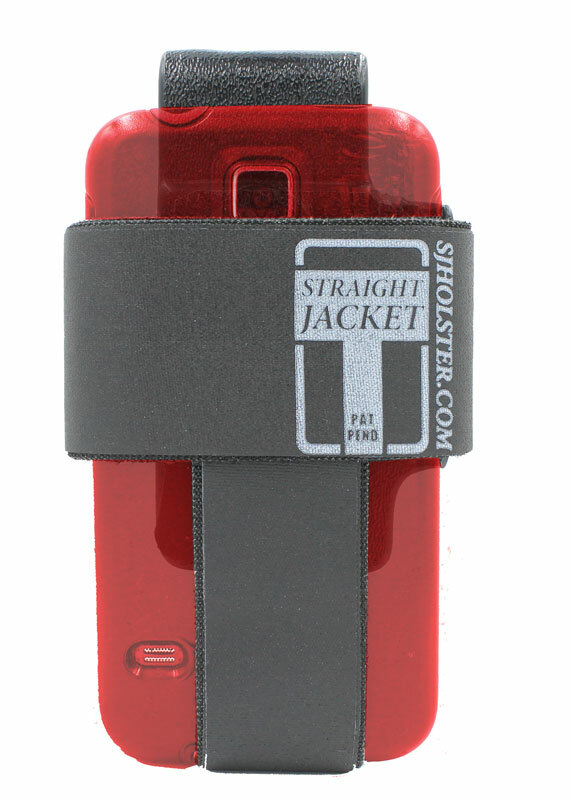 Stand Alone features That Bullseye Quickloads provide......... Load & Travel modes, Strength, and Adjustability. Thanks for your time.